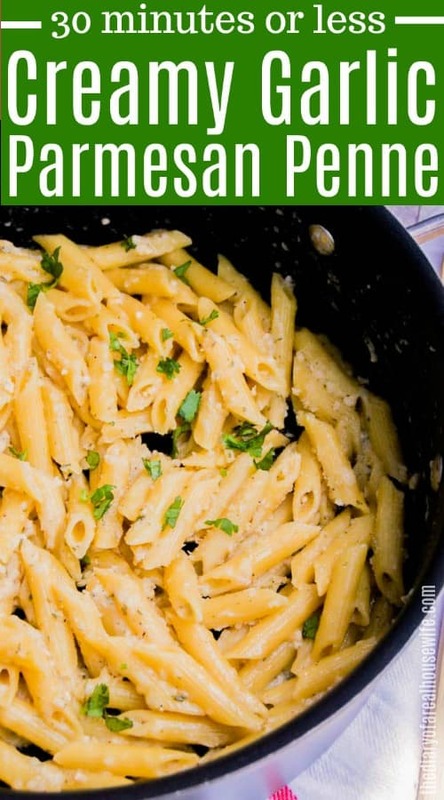 This Creamy Garlic Parmesan Penne works perfectly as an easy dinner or a delicious side dish. Everything is made in one pot for less clean up. In a large pot add oil then add minced garlic. Cook on medium/low. To the same pot add butter, broth, milk, parsley, salt, and pepper. Bring to a boil then add pasta. Cover and cook for 8-10 minutes until pasta is tender. Add grated parmesan cheese and mix until pasta is coated and all ingredient is well combined. How do I make the sauce thicker? If you want a thicker sauce then you can add butter then flour to your pot and mix until you get a paste. Add in milk and broth slowly whisking until you have a thickened sauce. Then continue with the directions. 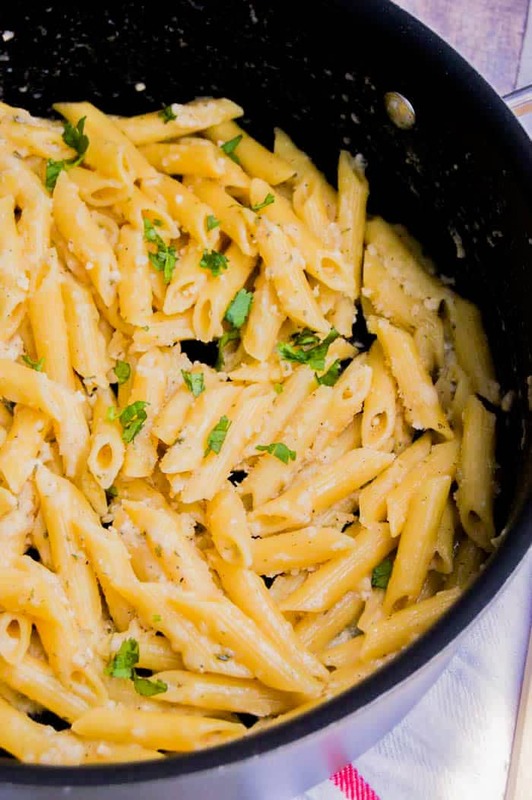 If you already cooked your pasta you can try adding cornstarch to this recipe to thicken it up. 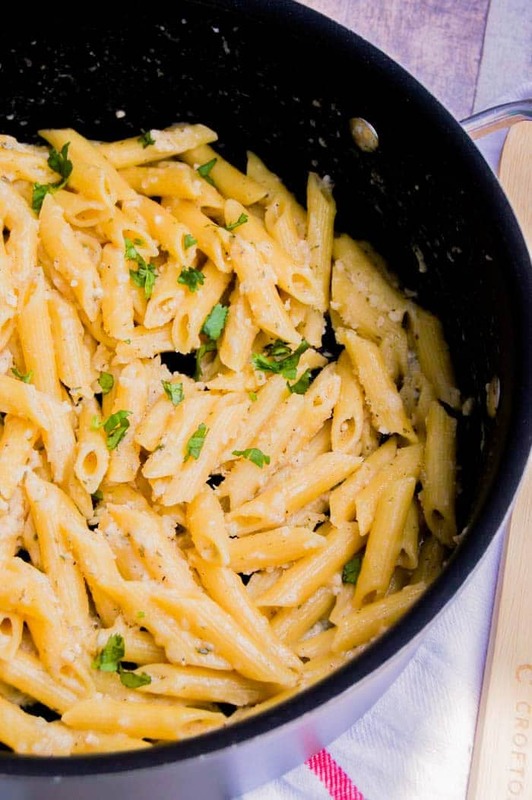 What other pasta can I use besides penne? 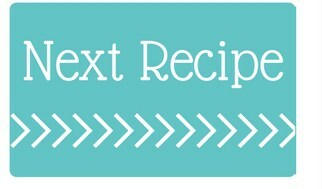 This recipe would work for several different types. You would just need to adjust your cooking time accordingly that are found on the package. What can I serve with this? One Pot Cheesy Chicken and Rice: Easy One Pot Cheesy Chicken and Rice makes the perfect dinner idea with little clean up after! One Pot American Goulash: American goulash is one of my families favorite easy dinner recipe. I love making this one pot version. One Pot Stuffed Pepper Casserole: This simple One Pot Stuffed Pepper Casserole is full of flavor and a recipe you will want to make over and over again. In a large pot add oil then add minced garlic. Cook on medium/low. To the same pot add butter, broth, milk, parsley, salt, and pepper. Bring to a boil then add pasta. Cover and cook for 8-10 minutes until pasta is tender. Add grated parmesan cheese and mix until pasta is coated and all ingredient is well combined. Optional: for garnish, I added fresh chopped parsley.